I’ve started my Valentine’s Day decorating for this year. Yay! This is exciting since it’s one of the only times I can go nuts with the colour pink. I love that there’s a day set aside for celebrating all the people that we love, and to do a little something special for them. Of course, we should love and cherish all those in our lives everyday, not just Valentine’s Day, blah blah blah, but come on!!!! It’s nearly the 14th, so let’s get started. Here is my completed Valentine’s Day vignette. 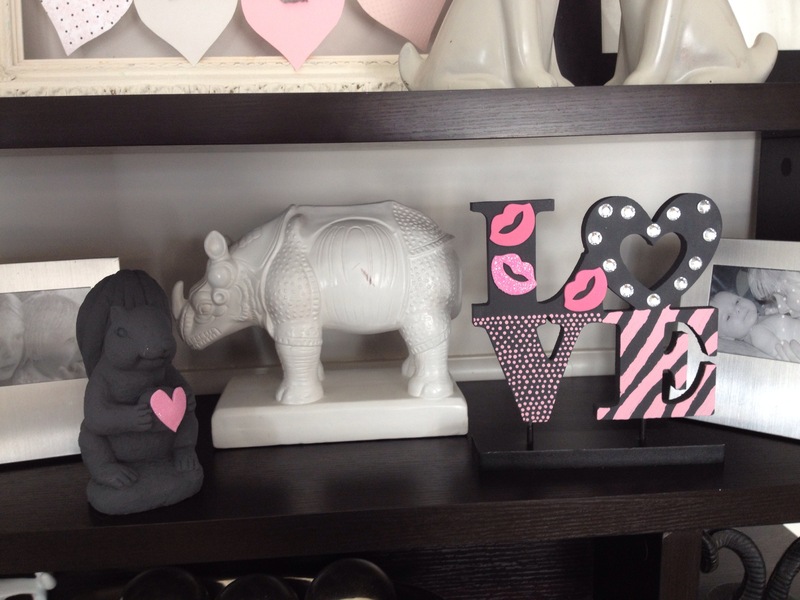 Here is a sneak peek of my living room (to be featured in another post), showing the whole shelf I’ve spewed Valentine’s Day love all over. I always used to buy the red hearts, and red Valentine’s Day decor items I’d see in stores, until a couple years ago, it occurred to me that I actually dislike the colour red, and very seldomly use it in my decor. 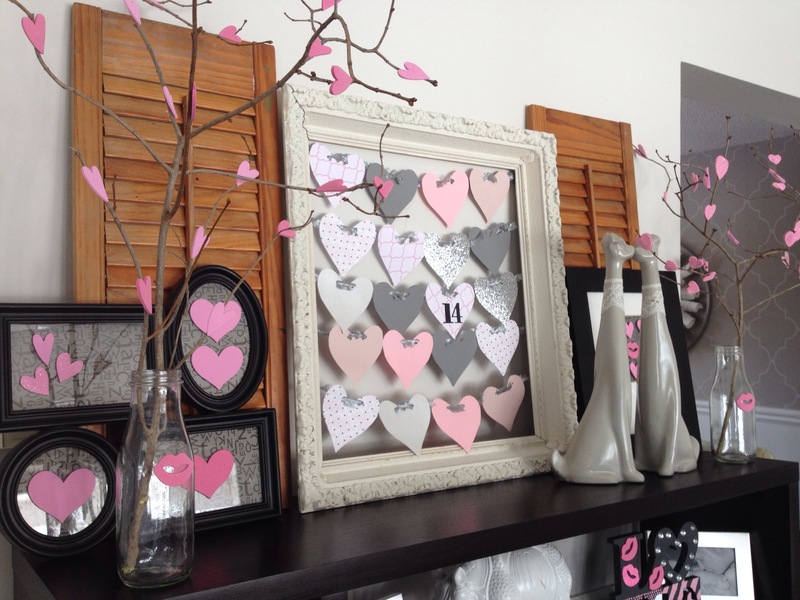 I do however LOVE pink, grey, and charcoal, so my new Valentine’s colour scheme was born. I coudn’t fit everything I wanted on to the shelf, so I displayed some items on the floor in front. The “presents” are just empty boxes wrapped in pretty paper. 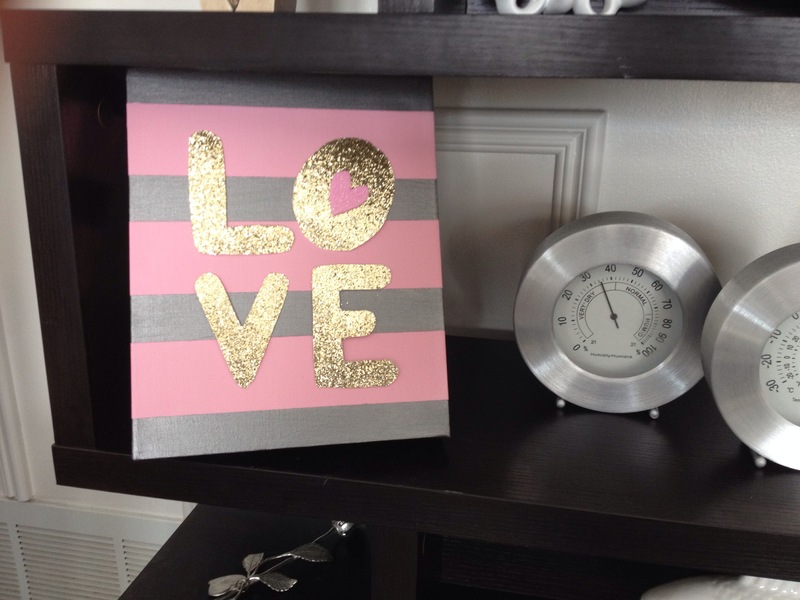 I created this “Love” sign using a $2.00 canvas from the dollar store, with simple craft paint and painter’s tape. I used some of my leftover gold scrapbook paper (that I used for my marquee sign) featured here, for the letters. This Love sign started off black, and cost $3.00. I painted it a charcoal colour, and added the pink embelishments with craft paint and foam stickers. You can also see my little squirrel has a heart on his acorn. Just another way to bring in the colour pink. I created this not-so-accurate calendar last year (I use this empty frame over and over for different vignettes, so you’ll be seeing it a lot). 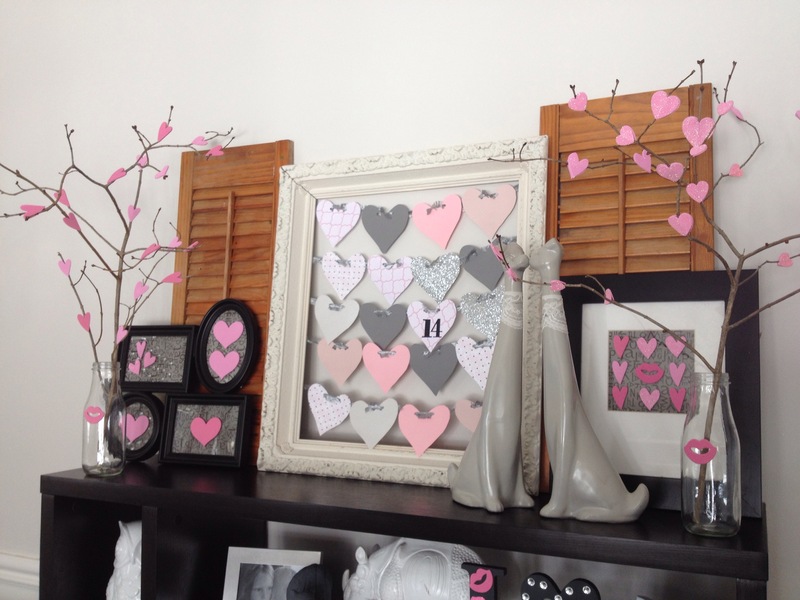 The hearts are made from scrapbook paper, purchased at Michaels. I punched holes in the top of the hearts, and used a grey fuzzy yarn to thread them all together. Painter’s tape was used to affix them to the back of the frame. The old shutters were purchsed for $1.50 each at a garage sale. I love how it makes it look kind of like a window. The grey kissing dogs are a favourite of mine, and they pretty much stay out all year round. I purchased them for $4.00 at a thrift store, spray painted them grey, and added lace for their collars. 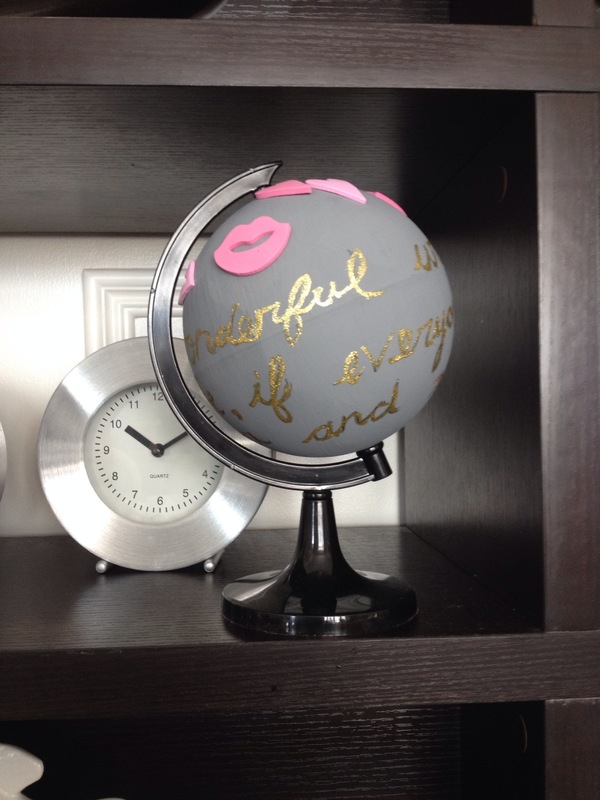 This love globe was fun to create. It started out looking like this. 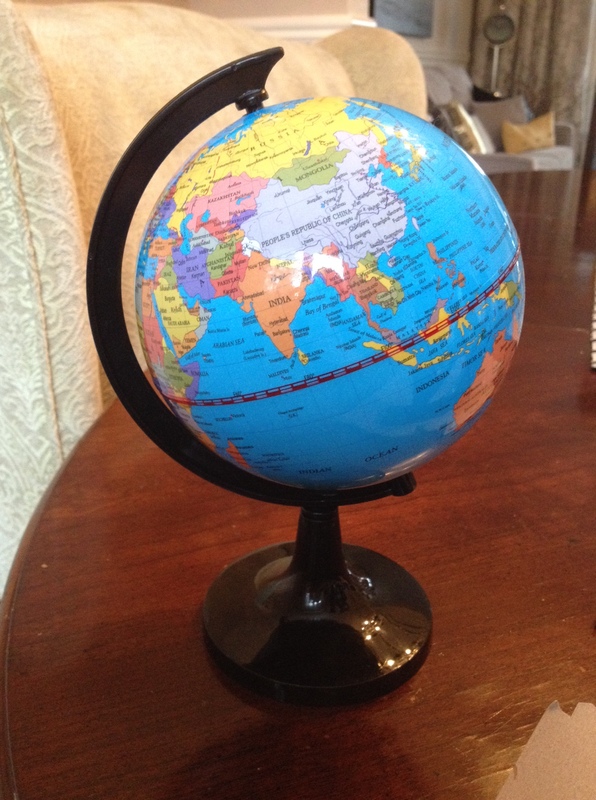 Just a plastic globe from the dollar store. 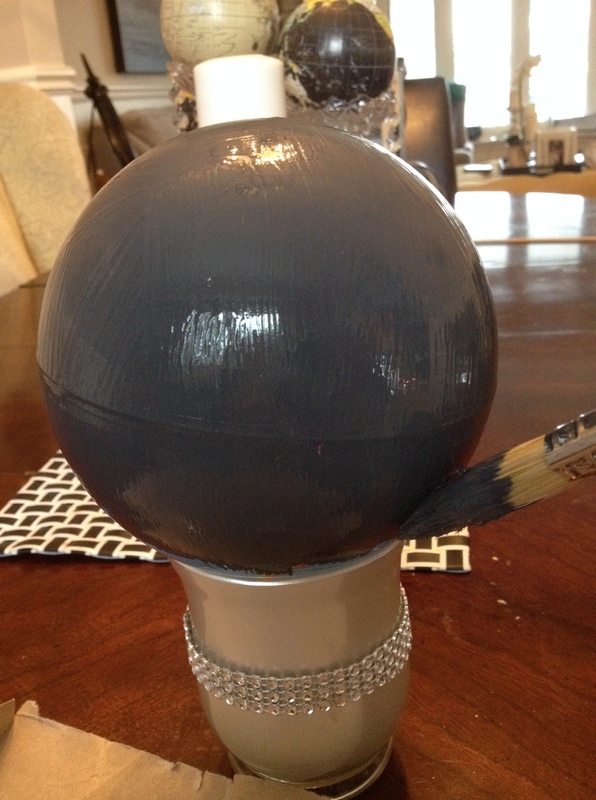 I painted it a charcoal colour with craft paint. Once it had a day to cure, I wrote in pencil what I wanted it to say. 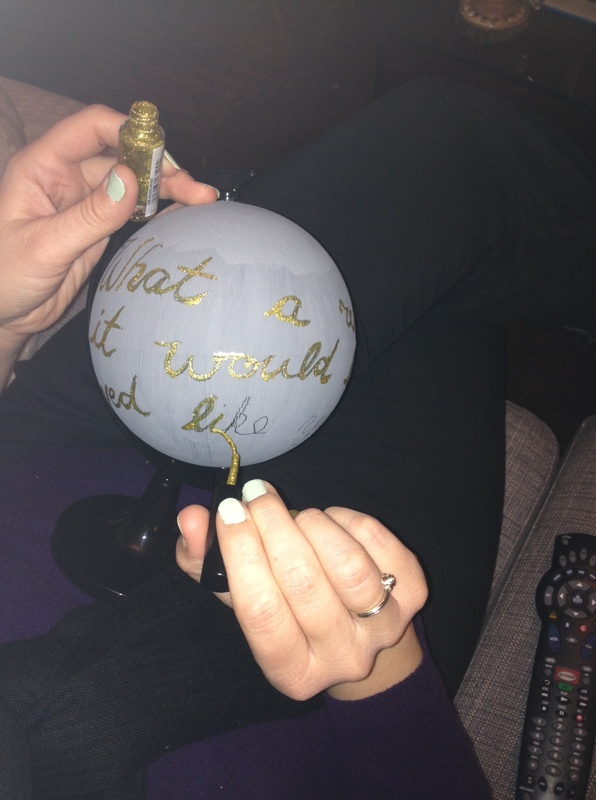 It says “What a wonderful world it would be if everyone loved like you and me.” I know it’s not grammatically correct, but it rhymes and sounds cute. 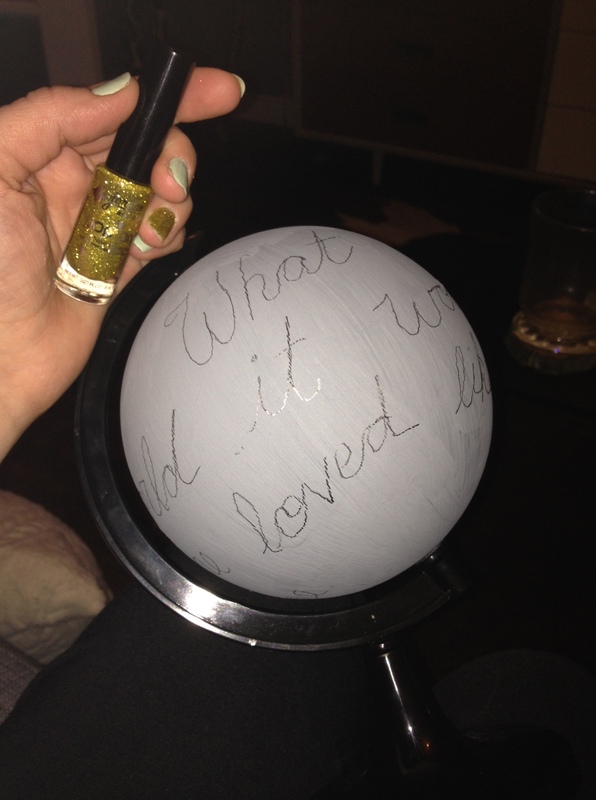 I used gold glitter nail polish, because I wanted the words to stand out against the charcoal globe. Once it was all done, I felt like it needed something more, so I added some foam stickers to the top, and now it fits in perfectly with all my other Valentine’s decor. Thanks for checking out my little blog. That’s it for the mid-week post. Hope you all have a love filled week, and I’ll see you on Saturday. If you enjoyed this post, please share on Facebook, Twitter, Pinterest, etc. and don’t forget to subscribe to my blog to receive email a notification whenever a new post is published.